On July 6th and 7th 2016 the IV. 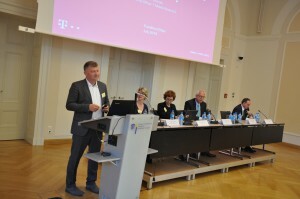 Viadrina Compliance Congress took place at the European University Viadrina in Frankfurt (Oder). 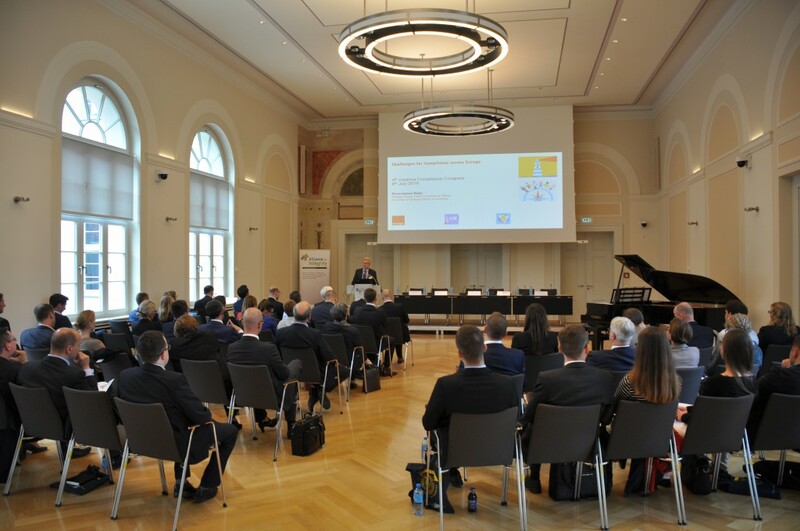 The Viadrina Compliance Center, in collaboration with the Compliance Academy Münster, invited speakers from the most different angles of Europe, to discuss the developments of cross-border compliance all over Europe with the tagline “Compliance Across Europe”. 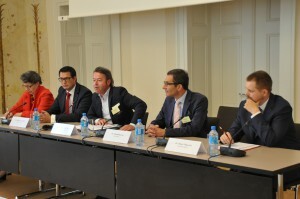 Four different panels spread over two days were supposed to open doors to the possibility of sophisticated exchange and a mutual learning process – regarding a European compliance-culture. The IV. 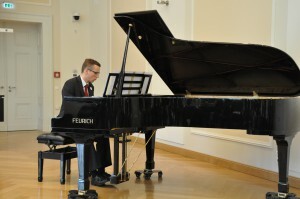 Viadrina Compliance Congress was inaugurated by Prof. Dr. Bartosz Makowicz (Viadrina Compliance Center) and Florian Lair (Alliance of Integrity). After two great and informative days were wished all participants, Pierre-Antoine Badoz (Orange, France) delivered his keynote. Based on the example of the operation of Orange in Mali, he highlighted the tension between compliance and finances. The growth of compliance always necessitates additional expenditure for the companies. When it comes to bribery the solution is crystal-clear for Orange: At first, even the smallest gifts have to be collected centrally, to distribute them to all employees at the end of a year. A quite feasible model. Moderated by Mirko Haase (Regional Compliance Office, Opel AG), Helena Sjöholm opened the first panel and gave the opportunity to think about different models of corporate governance. In this connection, the Norwegian model played the lead which relies on individual responsibilities, a reasonable hierarchic chain and self-regulation, which is basically classified between the two- and one-level model. Subsequently, Alain Casanovas (Partner, KPMG) pointed out how compliance is gaining relevance on the one hand – especially on an international level. On the other hand, he had a focus on the recently published compliance standards, to highlight the benefits of implementing a simple compliance-architecture. Eventually, Philip Brennan (Founder of Raisaconcern.com) reminded the participants of what compliance-culture represents and, following this, discussed the function of the Chief Compliance Officer. From a Russian point of view, Anatoly Yakorev (Director of the Center for Business Ethics and Compliance, International University Moscow) called attention to the challenges Russia is facing on the economic realm. Yakorev highlighted, that Russian companies are steadily adapting and implementing western management practices in order to foster cooperation with foreign partners. The second panel was all about cross-border internal investigations. Geert Delrue (Detective of Belgian police) for example talked about bribery and its different appearances from a practical standpoint. He distinguished between internal and external, simple and organized as well as local and cross-border bribery. 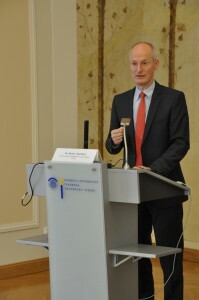 Marcin Szczepański (Regional Compliance Officer, Siemens), at first, recapitulated the corruption scandal of the year 2006 and pointed out certain measures applied by Siemens to restore trust and reputation. Equally interesting was the talk of Nico Zwikker (Lawyer, Zwikker Compliance Associates), who asked the participants to put themselves into the role of a Compliance Officer, to emphasize challenges waiting for them during a crisis and how to overcome those. With a twinkle in his eye, Zwikker wished the participants to have at least one vocational crisis. The panel got completed by Dr. Raluca Oprisiu (Lawyer, Stalfort). Oprisiu elaborately depicted the most important rulebooks regarding compliance in Rumania. In the end, she set two practical examples which represented possible internal investigations: a whistleblowing-hotline on the one hand and an Ombudsman in conjunction with personal interviews with employees on the other hand. After a short draft of the compliance developments by Dr. Rainer Markfort (Corporate Partner, Dentons) in the course of his keynote and the correct conclusion that compliance is not just fad, the third panel eventually addressed cross-border compliance standardization with Prof. Dr. Peter Fissenewert as the moderator of this panel. 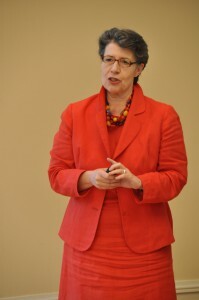 Dr. Barbara Neiger (Founder of neiger C. advisory e.U. ), for instance, focused on the Austrian compliance-standard ONR 192050 as well as on ISO 19600 and ISO 37001 and emphasized meaning and benefits of conformity audits. According to Dr. Daniel Lucien Bühr (Co-founder, Ethics and Compliance Switzerland), standards naturally are cross-border and cross-cultural and said that standards have to be easily accessible and cheap, in order to get implemented successfully especially by SMEs. Of interest was also the talk given by Michael Kayser (Director, Idox Compliance), who broached the issue of public perception of compliance standards. In general, the public is increasingly focusing on compliance standardization and therefore is also an issue for medium-sized companies. Dr. Oskar Filipowski (Compliance Chief Officer, KGHM Polska Miedź S.A.) understands compliance as an interaction of obligatory necessities and voluntary commitments of a company. Last but not least, the fourth panel turned on cross-border anti-corruption. Ingrid Leonard (Anti-Bribery Outreach Lead, International Corruption Unit) and Christine Uriarte (Senior Legal Analyst, Anti-Corruption Unit OECD) gave numerous examples of the cross-border fight against corruption and referred to some statistics, which proved remarkable progress. José F. Zamarriego Izquierdo (Director, Code of Practice Surveillance Unit of Farmaindustria) got to the point when he said, that ethics are an attitude and decision processes always have to be explainable in order to foster trust. A controversial question floated by Marcin Gomoła (Chief Compliance Officers, T-Mobile Polska) was if whistleblowers have to be protected or not. Besides the attempt at a solution for the whistleblower problem, he also showed risks for the whistleblower himself. The fourth panel was moderated by Dr. Werner Grebe (Lawyer & DICO-Member). 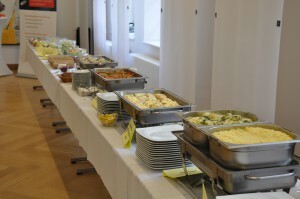 Summed up, we can claim, that the Viadrina Compliance Congress of this year was a complete success. It was interesting to see, that compliance gained relevance not just in Germany but all over Europe and that this is still an ongoing process. Although our speakers and participants sometimes had quite different views on certain subjects, they were united on one point: In the age of globalization, there is harmonization in the area of compliance. The cross-border momentum of compliance is increasing its speed and therefore also the relevance of how to attempt problems together in this area. A cross-border collaboration regarding a mutual learning process has to be continued.